As the bride, part of your job is to design the wedding displays that will adorn your reception hall and tables. There are so many different ways to add color to your decorations, such as wedding drapery, flowers, napkins, and centerpieces. But, most of these have been used so often that to the person who wants their wedding to be special, they have become old and passé. If you are looking for a way to up your game and give your guests something to remember, why not use the different sizes of wedding sparklers to your advantage? What, wedding sparklers come in different sizes and types? Absolutely! When you browse the selection at Wedding Sparklers Outlet, one of the first things you will notice is our varied selection. While some businesses offer nothing more than single length straight wedding sparklers, we take pride in offering three different lengths of standard wedding day sparklers along with heart shaped sparklers for you to choose from. Our goal is to have the right size and shape wedding sparklers to transform your special day into one that is truly magical. They can be used for your wedding exit, as part of your guests' place settings, and more. But, the big question is, "do you want the same size wedding sparklers for everything you plan to use them for?" Or do you want to vary things up a bit by using different sparklers for different things? Let’s take a look at the possibilities. Let's start with your guests' place settings at the reception. In the center of the table sits the centerpiece made of flowers, but what about a treat for your guests? 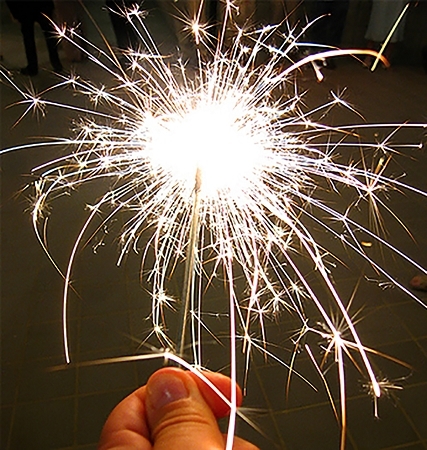 Wedding sparklers can be a great way to let your guests have a bit of fun at the table. But, you wouldn't want to use 36-inch sparklers that burn for 3.5 minutes, that would be way too much. However, 10-inch sparklers that only burn for 45 seconds would be the perfect choice. When wedding photo time comes around, you could go with 20-inch wedding sparklers that burn for 1.5 to 2 minutes to add a little extra magic to some of the photos. You could also use our heart-shaped wedding sparklers that burn for 50 seconds. Better yet, why not use a combination of both to create a range of different photos to keep as reminders of the most important day in your life! If you haven't quite made up your mind what you would like your guests to shower you with during your wedding exit, give everyone a 36-inch sparkler. These massive wedding sparklers will burn for a full 3.5 minutes. They’ll give the happy couple plenty of time to walk down the path through a dazzling shower of sparks and to their waiting vehicle. No matter how many different ways you plan to use our wedding sparklers to make your wedding day one that no one will forget, be sure to get the right size and shape for each activity. Not only will this help make the day more memorable, buying the right sizes will help keep your costs under control.